The elephant takes many forms. 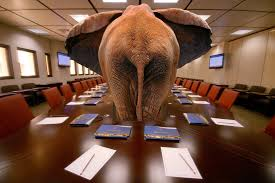 Sometimes it is a subject that no-one feels is appropriate, or it may be they are not comfortable bringing it forward, but many times the elephant is what it left on the table. By that I mean valuable input has not come forward because of the way the team communicates. Usually it is because team members do not understand how different personality types take in and respond to information. This may affect decision making and in many cases all of the information needed to make an informed decision has not been discussed because of differences in personality type. Knowledge of personality type and how it influences decision making can be a valuable tool for strategic teams and boards. It enhances a team’s ability to work through change management, stress, leadership development, and conflict resolution while building solid communications skills. In all cases effective communication is the key to taming the elephant. If you suspect you have one, you likely do! If you would like assistance in finding the elephant, please contact us for a free consultation.